The balance of opinion toward the Tea Party has turned more negative since June, when 37% viewed it favorably and 45% had an unfavorable opinion. And the Tea Party’s image is much more negative today than it was three years ago, shortly after it emerged as a conservative protest movement against Barack Obama’s policies on health care and the economy. In February 2010, when the Tea Party was less well known, the balance of opinion toward the movement was positive (33% favorable vs. 25% unfavorable). Unfavorable opinion spiked to 43% in 2011 after Republicans won a House majority and Tea Party members played a leading role in that summer’s debt ceiling debate. The Tea Party’s favorability rating has fallen across most groups since June, but the decline has been particularly dramatic among moderate and liberal Republicans. In the current survey, just 27% of moderate and liberal Republicans have a favorable impression of the Tea Party, down from 46% in June. 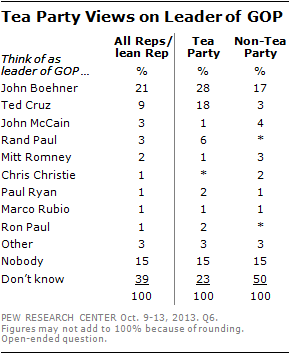 The new national survey by the Pew Research Center, conducted Oct. 9-13 among 1,504 adults finds wide divisions between Tea Party Republicans and non-Tea Party Republicans in how they view major issues, some leading GOP figures and even the relationship between the Republican Party and the Tea Party itself. 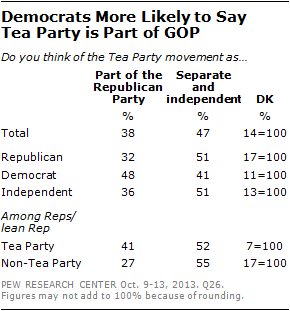 Tea Party Republicans are more likely than non-Tea Party Republicans to say that the Tea Party is part of the GOP, rather than a separate movement (41% vs. 27%). Amid the continuing budget standoff between Republican leaders and the White House, opinions about House Speaker John Boehner and Senate Minority leader Mitch McConnell have slipped among all Republicans and Republican leaners – both those who agree with the Tea Party and those who do not. By contrast, Sen. Ted Cruz’s popularity has soared among Tea Party Republicans while declining among non-Tea Party Republicans. Since July, as Cruz’s visibility has increased, his favorable rating among Tea Party Republicans has risen by 27 points – from 47% to 74%. In July, Cruz’s image was mixed among non-Tea Party Republicans (26% favorable, 16% unfavorable); most (58%) had no opinion of the Texas Republican. Unfavorable opinions of Cruz among non-Tea Party Republicans have risen 15 points since then, while favorable views are unchanged. 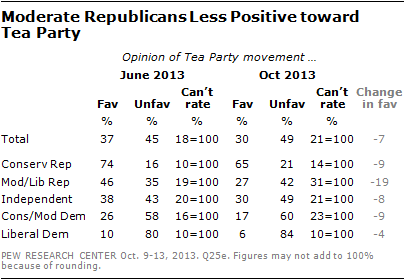 The decline in favorable views of the Tea Party over the past four months crosses party lines – Republicans, independents and Democrats all offer more negative assessments today than in June. For Republicans, the decline is steepest among those who describe themselves as moderate or liberal. Today, only about a quarter (27%) of moderate and liberal Republicans have a favorable opinion of the Tea Party movement, down 19 points from June. 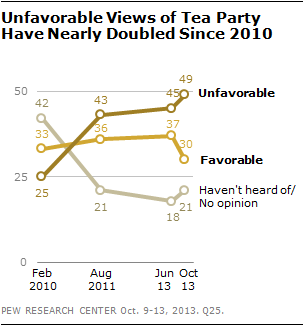 Yet the Tea Party’s ratings have also declined among conservative Republicans, from 74% favorable in June to 65% now. And although the proportion of Democrats with an unfavorable opinion of the Tea Party has changed little since June, these opinions have grown stronger—about half (51%) of Democrats now say they have a very unfavorable opinion of the Tea Party; in June 40% said this. Nationwide, 30% now say they have a very unfavorable opinion, up from 24% in June and just 10% in 2010. Meanwhile, the share expressing a very favorable opinion stands at 9% and is little changed over the past three years. 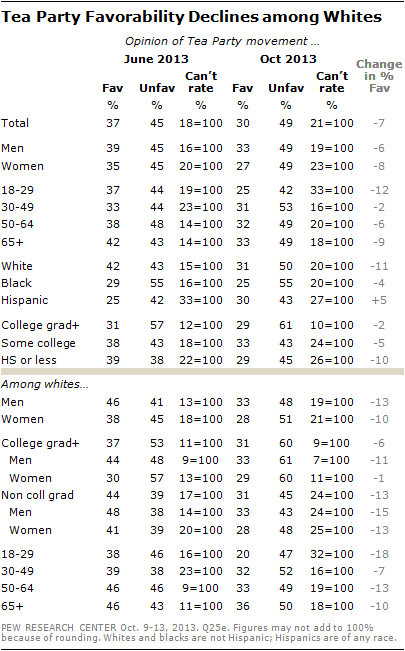 Over the past four months, public opinion of the Tea Party also has turned more negative across many demographic groups. The decline in positive ratings is particularly notable among whites and young people. And although favorable ratings of the Tea Party have declined across most age groups, there has been a 12-point drop among 18-29 year olds, just 25% of whom now have a positive view of the Tea Party movement. As negotiations over the debt ceiling and the government shutdown continue, the images of two GOP leaders central to these negotiations have suffered among the Republican base. Among all Republicans and Republican-leaning independents, 43% view House Speaker John Boehner favorably, while 35% view him unfavorably. In July, the same percentage had a favorable impression of Boehner, while fewer (28%) had an unfavorable opinion. Since then, unfavorable views of Boehner have risen slightly among Tea Party Republicans (by seven points) and non-Tea Party Republicans (six points). Favorable opinions of Boehner, among both groups, have changed little. Mitch McConnell’s ratings show a similar negative trajectory, though the Senate minority leader remains less well known. Overall, Republicans and Republican leaners are about evenly divided in views of McConnell (31% favorable, 32% unfavorable). In July, views of McConnell were, on balance, more positive (36% favorable, 24% unfavorable). A plurality of Republicans and Republican leaners who agree with the Tea Party continue to offer a favorable assessment of the Senate Minority Leader (45% favorable today), but the share who view McConnell unfavorably has risen from 23% to 32%. As might be expected, majorities of Republicans and Republican leaners view many leading Democrats unfavorably. Yet Tea Party Republicans stand out for the breadth of their unfavorable opinions, as well as the intensity of those views. 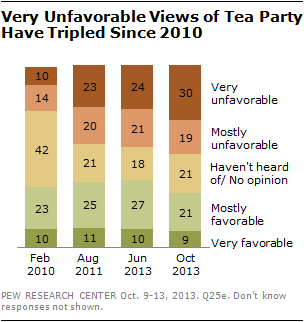 Fully 96% of Tea Party Republicans and 81% of non-Tea Party Republicans have an unfavorable opinion of Barack Obama. However, 77% of Tea Party Republicans view Obama very unfavorably, compared with about half (51%) of non-Tea Party Republicans. Both House Minority Leader Nancy Pelosi and Senate Majority Leader Harry Reid are far better known – and more widely disliked – by Tea Party Republicans than their non-Tea Party counterparts. Fully 84% of Tea Party Republicans view Pelosi very unfavorably, which is on par with highly negative views of Obama. Nearly two-thirds (65%) have very unfavorable impressions of Reid. 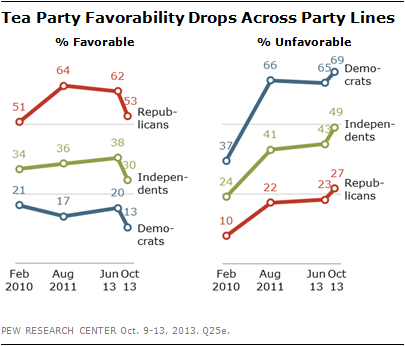 Among non-Tea Party Republicans, just 35% view Pelosi very unfavorably while 22% view Reid very unfavorably. Although Tea Party Republicans’ ratings of Hillary Clinton also are overwhelmingly negative – 83% view her unfavorably – they are less extreme. 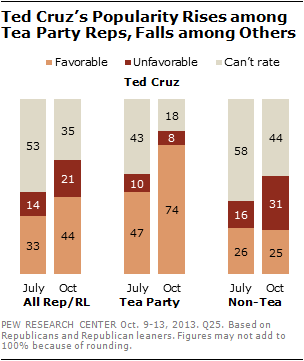 Roughly half (49%) of Tea Party Republicans offer a very unfavorable rating of the former Secretary of State. Hillary Clinton is viewed favorably by 43% of non-Tea Party Republicans, which is substantially higher than the other leading Democrats tested. Is the Tea Party Part of the GOP? 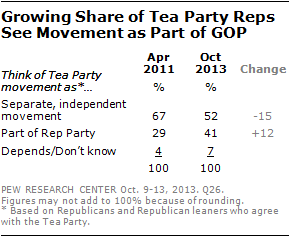 Since April 2011, Tea Party Republicans have become more likely to see the Tea Party movement as part of the GOP. In 2011, Republicans who agreed with the Tea Party said the movement was separate from the GOP by a 67%-29% margin (38-point gap); today, that margin has narrowed to 52%-41% (11-point gap). A Pew Research survey conducted in early October found that over the past two years Tea Party Republicans also have become somewhat less likely to say Republican leaders in Congress are paying too little attention to the ideas of the Tea Party. For more, see: “Partisans Dug in on Budget, Health Care Impasse” released October 7, 2013. 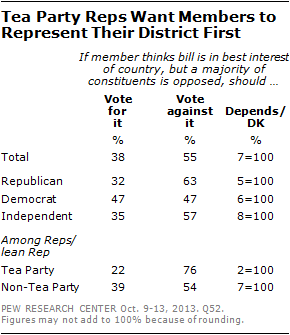 Should Members of Congress Vote with District or National Interests? When members of Congress face a choice between voting for what they think is best for the country and voting with the views of their constituents, the public’s stance is that members should vote to represent their district. This view is particularly prevalent among Tea Party Republicans. When asked who they think of as the leader of the Republican Party, more Republicans and Republican leaners volunteer John Boehner than any other name. About two-in-ten (21%) say Boehner is the leader of the Republican Party, while 9% say Ted Cruz; other names are mentioned by no more than 3% of Republicans and Republican leaners. Boehner has become more prominent as the leader of the party over the last three months. Since July, Republicans have become 12 points more likely to say they think of Boehner as the party’s leader; mentions of Ted Cruz have also risen (from 2% to 9%). (39%) or that no one leads the GOP (15%). Nearly three-in-ten Tea Party Republicans (28%) say Boehner is the leader of the party; Cruz ranks second among this group at 18%. Non-Tea Party Republicans are less likely to offer a response to the question (50% don’t know who they think of as the party’s leader). 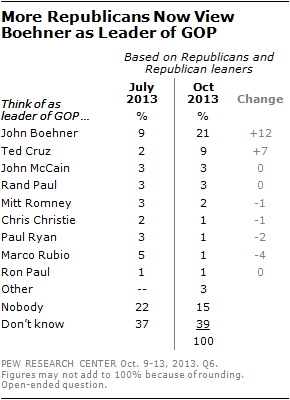 Among those who do offer a response, Boehner is cited as the leader by 17%, while just 3% cite Cruz. Who Identifies with the Tea Party? Over the past three-and-a-half years, the Pew Research Center has tracked public affiliation with the Tea Party through a simple question: asking the respondent whether they agree or disagree with the Tea Party movement or don’t have an opinion either way. In the early days of the Tea Party movement, agreement typically exceeded disagreement. In March 2010, 24% said they agreed and just 14% disagreed. Agreement with the Tea Party peaked in November 2010 at 27%, shortly after the midterm election. But the balance of opinion flipped in 2011, as many existing and newly elected Republicans in Congress formed a Tea Party Caucus and took a more active role in legislative debates. 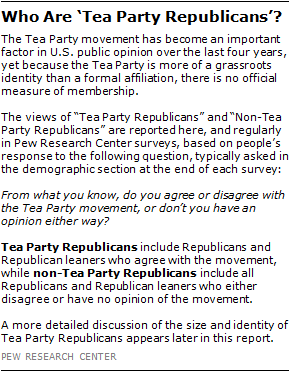 By March 2011, 25% disagreed and 19% agreed with the Tea Party, an eight-point decline in agreement from the 2010 peak. This balance of opinion held for most of the past three years. The current survey measured the highest level of disagreement over this timespan, with 32% saying they disagree with the Tea Party movement. About four-in-ten (41%) Republicans and Republican leaners agree with the Tea Party movement, while 45% say they have no opinion either way and an additional 2% volunteer that they haven’t heard of the movement. The percentage agreeing with the Tea Party has declined from its peak of 51% in November of 20101, and has fluctuated around 40% for much of the last year. Few Republicans disagree with the Tea Party (11%), though this percentage has edged up from the low single digits in early 2010. Among Democrats and Democratic leaners, 52% disagree with the Tea Party while 46% say they have no opinion either way and just 2% agree. This marks the first time that Democratic disagreement has edged above 50% and represents a significant change in opinion since the spring of 2010 when far more Democrats had no opinion about the Tea Party (68%) than disagreed with it (25%). Because of this, about nine-in-ten (92%) Americans who agree with the Tea Party either identify as Republicans (53%) or lean to the Republican Party (39%). Just 1% of all of those who express agreement with the Tea Party identify as Democrats, while 5% lean to the Democratic Party and 2% have no partisan leaning. The roughly four-in-ten Republicans and Republican leaners who agree with the Tea Party are more likely to be male (61%) than non-Tea Party Republicans (50%) and they tend to be older: 57% of Tea Party Republicans are age 50 or older, compared with 45% of non-Tea Party Republicans. Both Tea Party (83%) and non-Tea Party Republicans (81%) are predominantly non-Hispanic whites, this compares with 68% of the public overall. Tea Party Republicans have higher levels of income and education than Republicans and Republican leaners who do not agree with the Tea Party. 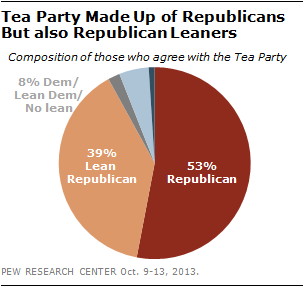 For example, 34% of Tea Party Republicans have a college degree compared with 26% of non-Tea Party Republicans. 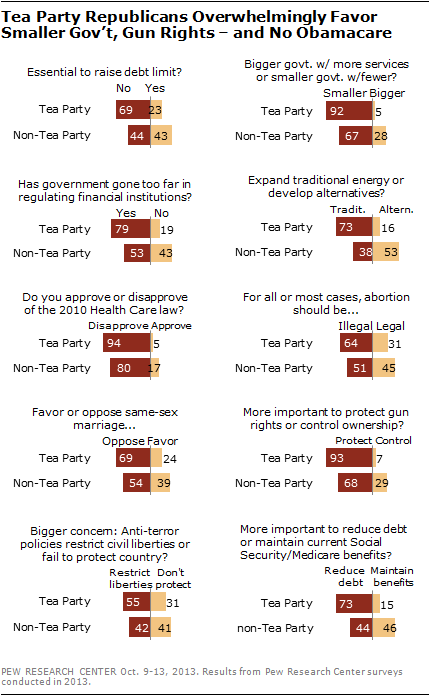 The distinct views of Tea Party Republicans can be seen across a range of issues. A driving attitude of the Tea Party is a belief in smaller government: Fully 92% of Tea Party Republicans prefer a smaller government with fewer services, just 5% want a bigger government. Among non-Tea Party Republicans, a smaller government is preferred by a less one-sided 67%-28% margin. Similarly, 93% of Tea Party Republicans say protecting gun rights is more important than controlling gun ownership, compared with 68% of non-Tea Party Republicans. On energy, 73% of Tea Party Republicans prioritize expanding the production of traditional sources; just 16% say developing alternative sources should be the priority. On balance, Republicans who do not agree with the Tea Party take the opposite view: 53% say developing alternative sources is the more important energy priority, 38% say expanding production of coal, oil and natural gas is more important. Beyond their policy views, Tea Party Republicans are also distinct in how they look at the political situation in Washington: most notably, they tend to back a hard line when it comes to compromise, and want to see the GOP move in a move conservative direction. By a 68%-26% margin, Tea Party Republicans interviewed in July said Republican leaders should move in a more conservative, rather than more moderate, direction. And when it came to compromise, 50% said Republicans in Congress had compromised too much with Democrats, just 14% said they hadn’t compromised enough. 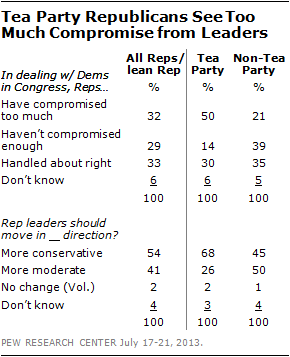 These views were in stark contrast with those of non-Tea Party Republicans: 39% of Republicans who don’t agree with the Tea Party said GOP leaders had not compromised enough, 35% said they handled things about right and just 21% said they had compromised with Democrats too much. In addition, about as many non-Tea Party Republicans wanted the Republican party to move in a more moderate direction (50%) as in a more conservative direction (45%). In the current debate over the debt limit, nearly seven-in-ten (69%) of Tea Party Republicans think that the country can go past the deadline for raising the debt limit without major economic problems, and fully 52% say the debt limit does not need to be raised at all. For more, see: “As Debt Limit Deadline Nears, Concern Ticks Up But Skepticism Persists,” released October 15, 2013.